From the very start of the Real Job, it became clear that this was not an ordinary Real Job, nor an ordinary client. 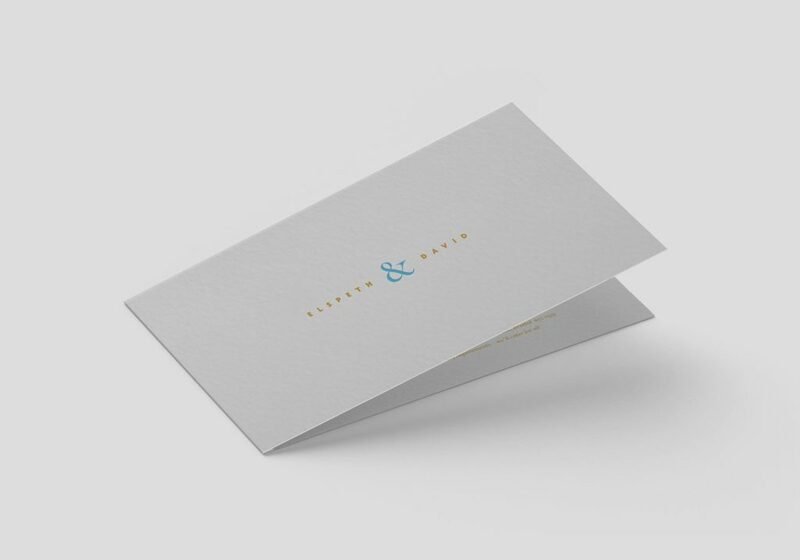 Geoff approached us – having completed the letterpress module the term prior – to print the wedding invitations for the wedding of Paul Luna’s son, David. This was intimidating at first as we had only ever heard about Paul and his design reputation within the department, so we knew we would have our work cut out. 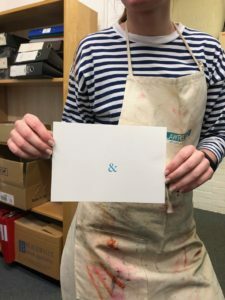 During the briefing, we realised that rather than being involved in the design process like any other ‘regular’ Real Job; we would instead be purely involved in the production process – letterpress printing. During an informal meeting with Paul, overseen by Geoff, Paul laid out what he wanted to achieve and the full requirements of the job. If it wasn’t intimidating to begin with, after his request for 200 invitations to be letterpress printed, it certainly was. In the letterpress module, we were only required to produce a set of six identical prints for submission, so 200 seemed like a near impossible task. During this meeting, we also got an understanding of the ‘perfection’ that our client would like, as he showed off the invitation design, and we discussed colour and card-stock. During this Real Job, we gained real experience working in the production phase of the design process that is often underappreciated. We took several steps to ensure that time management and quality of the final prints were at their best. We mixed the colour whilst waiting for the printing plates and paper to arrive, as this was the most efficient use of time and allowed us to begin promptly when the plates finally arrived. To ensure we could manage the workload, we decided as a production team to work in ‘shifts’ with two people working together in the workshop, while the third person had the time off. In reflection, this was a fantastic decision as it allowed us to work efficiently, whilst not taking up too much space in the printing workshop or constantly knocking into each other. The exception to this was while mixing the colour, as we decided it would be best to have as many eyes to judge the colour match as possible. Paul provided us with Pantone references, and colour samples to be used to match the inks to. These informed all our decisions, and we tried where possible to get a perfect match. Mixing the colours was very frustrating at first, as we not only had to match the colour to the standard liked by Geoff, but also our client – Paul Luna. The level of perfection needed in a match, took hours to achieve at first, and made us uncertain for the future of the Real Job as we were unsure if we would be able to meet the high standards expected for the print itself. However, we eventually arrived at the two colour matches that Paul was looking for. An example of the colour matching process, showing around 50 ampersand prints each with the same colour printed and controlled throughout. A test print, showcasing the first time we managed to match the printed blue, to the specified blue on the pantone books. The same keen eye for perfection was also witnessed when Paul rejected the original printing plates as they had imperfections – making us agonise over the quality of the print that was expected. In reflection, the pressure that this created was a good thing. Although we all faced frustration at the hands of not being able to meet the high bar set for us, it meant the job arrived at a very high, near professional quality. As expected, the days spent in the workshop were long with the team not stopping until we had met the quota of prints needed to keep with the tight schedule. The first session took around seven hours to get the correct colour flowing and the alignment exact on the ampersand, as well as running off 50 prints to give an idea of the length the job would take. Another hurdle we faced was the fact that each invite would have to run through the press four times, to account for the double-sided print and the two colours used on each side. This was difficult to comprehend at first, realising quickly that to get the 200 flawless invitations, we would have to print around 400 of the first plate to account for loss at each stage. 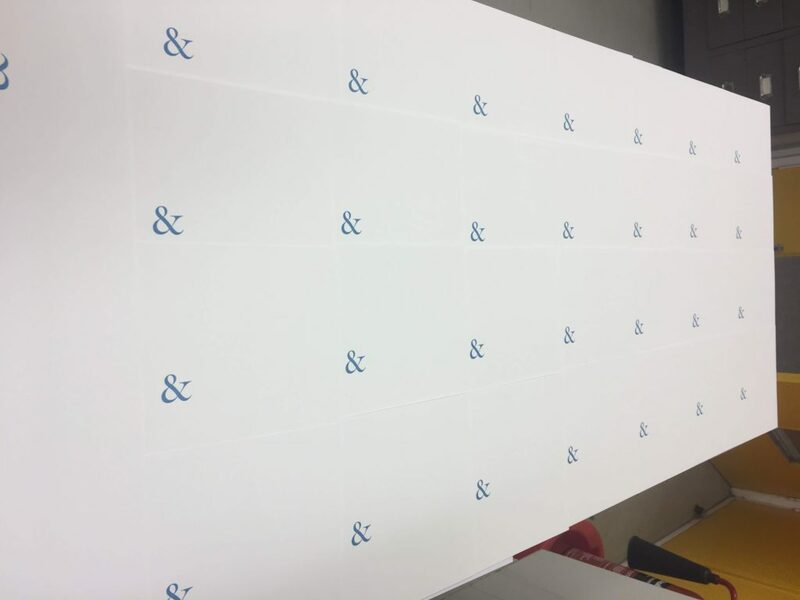 One of the challenges we overcame was adapting the colours to ensure a better coating on the heavy card-stock, especially the duck-egg blue that did not print the fine lines of the ampersand as crisp as we would have liked. After the addition of solid white, this drastically improved the print quality, while staying true to the original colour swatch, as the solid white compensated for the off-white card-stock. Other challenges included the appearance of ‘wonky’ registration between plates, and inking consistency. Through Geoff’s careful guidance, we found ways to alter the inking impression and flow of the ink by changing the height of the plates and amount of ink on the rollers. As Paul works heavily in the department, he was also able to drop by to provide feedback and was on hand for instant critique at each stage. This also meant that he would drop by the workshop and watch us print occasionally. Although his company was welcome, we learnt how nerve wracking it could be for a client to be in the same room, constantly evaluating us whist we work. This would be something we would all like to avoid in the future if possible. Contrary to this, when we did achieve perfect prints, which as time went on happened more and more often, we were able to see our client directly look happy with the work. This was beneficial over having to decipher their response via emails, like many other jobs. This was a welcome change, watching Paul excitedly sending pictures to his son of the process, kept us going throughout the project. As time went on, we became very efficient at printing as a team, and began timing our prints out of curiosity and found that we could print at a sustained rate of 1 print every 30 seconds by the end of the job, using the Plantin press with 2 people. This put into perspective how difficult it would have been to create long print runs when letterpress was the only option for production, and even more painful for the printer who was repeatedly operating the press, as it took a lot of effort from the operator, comparable to a core workout! This was one of the first live jobs that we had all felt a considerable level of frustration towards, between the long hours and energy put into it, and the high bar of quality expected, we all had our work cut out. The job also happened during a period when we were all very busy, and therefore, taking whole days out in the printing workshop became very difficult. However, this made the job that much more rewarding, and seeing Paul’s happiness with the invitations made it all worth it. It was also eye-opening to be so involved with the production process, giving us all a new-found respect for how hard production teams must work to achieve perfection, giving us all something to consider when we send a job off into the void of the press. It also gave us a chance to have a break, away from our computer screens, and go ‘back in time’ so to speak, which in a sense was a nice change in pace from design. This physicality also gave us the opportunity to watch ourselves improve over time, eventually arriving at the 200 near professionally finished wedding invitations all on time and ready to be sent to the guests. The finalised wedding invitation print. Unfortunately we had to use mock-ups for this as all of the invitations were required to be sent out before we were able to photograph them properly.